This week we're welcoming Kensington author Mingmei Yip as she discusses her debut novel, PEACH BLOSSOM PAVILION, available now. She is joining us to answer questions and give away a copy of this remarkable novel. Congratulations on your successful debut novel PEACH BLOSSOM PAVILION. Can you tell us what it is about? Thank you! PEACH BLOSSOM PAVILION is the story of the last Chinese courtesan, or Geisha, set in the 1920s Shanghai. I am pleased to report that it has generated many good reviews and is now in its fourth printing. When the novel begins, the protagonist Xiang Xiang, now ninety-eight, is telling her great-granddaughter about her life as a famous prostitute more than seventy years ago. Her story began when at thirteen, Xiang Xiang was tricked into a prostitution house after her father had been executed for a crime he did not commit. Her mother, now destitute, leaves her daughter to enter a Buddhist Nunnery. This beginning grabs attention, but it sounds like a pretty miserable story, right? It does seem that way in the beginning. But Xiang Xiang is determined to escape from the prostitution house so as to find her mother and avenge her father's death. On her quest to achieve these seemingly impossible goals, she endures many hardships. She also has two poignant love affairs, one with a handsome monk, and another people will have to read the book to find out. I like the title PEACH BLOSSOM PAVILION. It evokes such a beautiful and poetic image. Can you tell us more about it? High class prostitution houses in traditional China had many elegant sounding names, such as Sleeping Flowers Pavilion, Jade Gate Pavilion, Plum Blossom Garden , and Welcoming Spring Pavilion. The women who worked there were not mere prostitutes, but cultured, artistically accomplished courtesans, or Geisha, patronized by powerful government officials, learned scholars, or wealthy merchants. Were Chinese Geisha similar to the Japanese ones? Yes, both were elegant, artistically talented women, who, due to cruel fates such as overnight loss of family fortune, untimely demise of their parents, or kidnapping by bandits, ended up in prostitution houses. While Japanese Geisha still exist, though in a less racy context, their Chinese counterparts passed into history when China became Communist. What made you decide to write a novel on Chinese Geishas, and are there comparisons of PEACH BLOSSOM PAVILION to MEMOIRS OF A GEISHA? I came about this indirectly. I play professionally a very ancient Chinese stringed instrument called the guqin, a kind of zither. While doing research on women who played this instrument, I found out that many were courtesans. This was a surprise to me because the guqin has always been presented as an instrument only for the respectable elite. I decided to go to China to research this Chinese courtesan culture because I found these women's lives and their arts both intriguing and inspiring. Despite what had to have been a mostly miserable life, some were able to rise above their fates by practicing the arts of poetry, painting and music. Their determination deeply touched me. A few even escaped prostitution. A famous one, named Golden Flower, rose from a prostitution house to marry an ambassador and later became the mistress of the most powerful European general stationed in China . She used her influence to stop pillage by European soldiers and even, it is said, saved the life of the Empress. Another reason is that when I talked to Americans, almost all had heard of Japanese Geishas, but no one even knew that Chinese Geishas existed. So I wanted to give these courageous and talented women the voice they had long been deprived of. There is much more about Chinese Geishas, as well as my performance of some of their music on my website. Yes, a few people compared my novel to Arthur Golden's MEMOIRS OF A GEISHA. I can assure the readers that my story is completely different. The only similar thing is the Asian setting which is inevitable, since both are about geishas and their culture. Now can you tell us how do you write a novel from beginning to end? Do you have an outline and have all the details work out first? I'll always have an idea first, then throw in plot and sub-plots together with characters. Since I'm somewhat of a free spirit, I never write a whole outline or set down the details for each chapter. Once I have started a story, it takes on a life of its own and the characters lead me where the story wants to go. I don't try to write out the plot ahead of time because it always changes while I am writing. It seems that you have lots of ideas--how do you get them? They come from all sorts of places: reading, watching people, my dreams, Hong Kong newspapers, experiences of my friends. Often I don't know where ideas come from--they just pop into my head. When I take the subway, I don't read or listen to music; I just watch the other passengers, one of my favorite pastimes. If I see an interesting face, then I'll make up a story for it. A beautiful, older woman may be an opera singer on her way to meet her poor, young lover--behind the back of her husband, who is also her manager. An old man maybe going home, just to heat up and eat his frozen dinner, watch sports on his twenty-year-old TV, then go to sleep in his solitary bed. Because he never married, and never had the chance to know the only child he might have had from a one-night stand on one cold winter night years ago. If I have an interesting dream, I try to jot it down quickly the moment I wake up, otherwise it will fade. After I have an initial idea for a story, I'll finish my first draft as quickly as possible, so I'll have the entire novel set down. Then I get to work trying to fine tune everything--narration, characterization, voices, dialogue, and so on. Then I slow down for the third draft to make sure everything is correct, especially in an historical novel when it's important to be accurate. When I wrote PEACH BLOSSOM PAVILION, I spent a lot of time checking and double-checking to make sure not only the dates but the more interesting details such as locations, architecture, clothing, even hair styles were all accurate. Then I keep re-reading to catch any remaining glitches. I feel an author is obligated to the reader to be sure that the book is a good read, not only entertaining but providing something more, insights or new experiences. 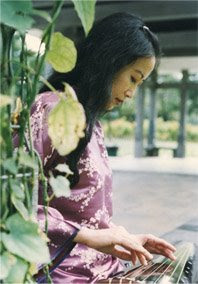 Many who have reviewed PEACH BLOSSOM PAVILION found it to be a real page-turner. How do you make your writing interesting? Interest is in the details. Plot is critical but it is what you do with it that makes a story come alive. I am a very curious person and find interest in almost anything. My reading materials range from academic papers to entertainment magazines to politics. In politics, much of human nature is revealed so it provides great raw material for character depictions. The many different strategies used in politics are also excellent for plots. The same is true of the entertainment world. Reading is important too. There's a famous Chinese saying, "If you have read ten thousand books and traveled ten thousand miles, your writing will feel like it's aided by the highest spirits." Do you have any advice for writers, especially beginners? I think it is still essential to master the basics. Not only voice, characterization, dialogue, plot, but also sentence structure, its rhythm and music. I always try to vary the length of my sentences and start each one with a different subject. It's essential to spent whatever time it takes to find the right word. Sometimes, it is a single word that brightens a whole paragraph. There is a Chinese saying "Slap on the thigh and exclaim." That's how the readers will react to a good choice of word. Readers may not be aware of the meticulous hard work behind a smooth sentence, but if you don't pay attention, they will soon become bored. I also think it's good for authors to attend other cultural activities such as movies, concerts, art exhibitions. Have as diverse a background as you can cultivate, that really helps. Would you tell us what is your next project? My next novel is an inter-racial Buddhist love story about a young Chinese woman who wants to be a nun but falls in love with an American doctor against the wish of her nun mentor. This will come out in April of 2010 from Kensington Books. My third novel, scheduled for 2011, is also a love story, this one set along the Silk Road. A Chinese woman is sent on a quest by her supposed aunt where she meets a younger American man. The reward is three million dollars. To attain it, amidst the distractions of her love affair she must carry out the ordeals decreed by her aunt along the treacherous Taklamakan desert, whose name means, "Go In, Never Come Out." I'm sure all our readers are anxiously looking forward to reading both of your forthcoming novels! Thank you, Carrie, for inviting me to guest blog. I've really enjoyed it. Mingmei is giving away a copy of this beautiful book! For your chance to win, leave a comment or question. I'll draw the winner next Sunday. Good luck!